Although I’ve mentioned these shoes a few times here, and they’ve been on my Wish List ever since I first discovered them, back at the start of the year, I hadn’t actually intended to buy them just yet. The weather, you see, really hasn’t been conducive to the wearing of pale-coloured court shoes: in fact, I’ve been in either boots or wellies for all of January, and that doesn’t look set to change anytime soon. I really hate buying things and then not being able to wear them for weeks (or months, as the case may be), so I figured I’d maybe buy these sometime in Spring, once I was back to wearing “real” shoes again. My plan, however, was foiled, as it always is, by that pesky habit things have of selling out so quickly that unless you buy them as soon as you see them, you have to resign yourself to a lengthy eBay hunt – or just doing without altogether. These arrived on the River Island website at the start of January, but when I checked last week, I noticed they’d already sold out in quite a few sizes. Uh-oh. My size was still available, so I decided to test my willpower and hold out a little longer. I managed it up until Saturday morning, when I checked again, and realised they were now sold out in EVERY size… except for mine. I’ve loved these for a long time now, but at £735, I just can’t afford them. The £65 I paid for these River Island pink studded shoes sounded pretty reasonable in comparison, and while the workmanship just isn’t up to the same standard as Louboutin, they’ll be pretty decent understudy shoes for now, until such a time as I can afford the real thing! 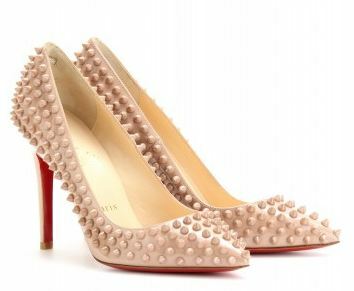 These have leather uppers (The Louboutin shoe has a patent upper: these are matte leather) with matching pink studs, and a fairly manageable 11cm heel. I ordered my usual size 4 (Thankfully that was the only size left!) and they fit true to size, as is generally the case with River Island shoes. As I mentioned, the weather is preventing me wearing the shoes I want to wear right now, so I’ve yet to venture outdoors in these, but they feel pretty comfortable so far: I noticed a slight rubbing on the side of one foot when I walked around the house in them, but they’re real leather, so should soften up nicely. These are currently sold out on the website, but my experience of River Island is that they tend to hold much lower levels of stock online than they do in store, and these are from the Spring 2013 collection, so there’s probably a decent chance of them being able to track a pair down for you if ask nicely! I am rather envious of these Amber, I really want them! But sold out 🙁 I am also a 4! I am absolutely convinced that I will hurt myself or someone else with spiky shoes. Even as I say that, I really do want some like this. got them on time on-line, but they are to big, and now I can’t replace them for smaller size! could go for 5 instead of 6, will have to put some insoles. any way, they are amazing!